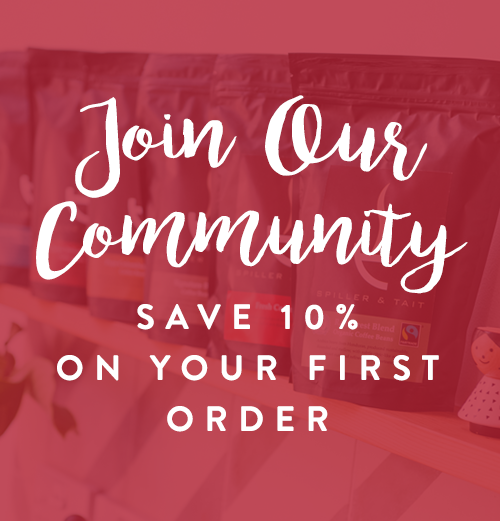 Want to learn more about our coffee subscription? New to Spiller & Tait? Try 4 of our customers favourite espresso coffee ground or beans. This is a wonderful selection of coffees selected specifically for espresso use (including Bean-to-cup machines). Whether you're a seasoned coffee connoisseur or a new convert to the world of freshly roasted coffee, these four varieties will delight your taste buds and allow you to sample the very finest espresso coffees in our range. 1 x Signature blend 250g - Our award winning and most popular blend. All standard orders received by 9am Monday to Friday will be processed the same day and delivered within 5 working days. Orders received over the weekend will be processed on the next working business day. Parcels up to 1.9 kg will be sent via Royal Mail at a rate of £2.95, which will be added at check-out. All expedited orders are sent via courier. Orders received before 9am on a weekday will be processed/dispatched the same day and received the next business day at a rate of £7.99, which will be added at checkout. Orders received over the weekend will be processed on the next working business day. We work with established national couriers who guarantee next business day deliveries. In the event you parcel does not arrive next business day we will refund the £7.99. Parcels over 1.9 kg usually qualifies for Free Delivery and is sent via courier. All orders received before 9am Monday to Friday will be processed the same day and delivered within 5 working days. Orders received over the weekend will be processed on the next working business day. If the order does not exceed £25 then a charge of £7.99 will be added at checkout.